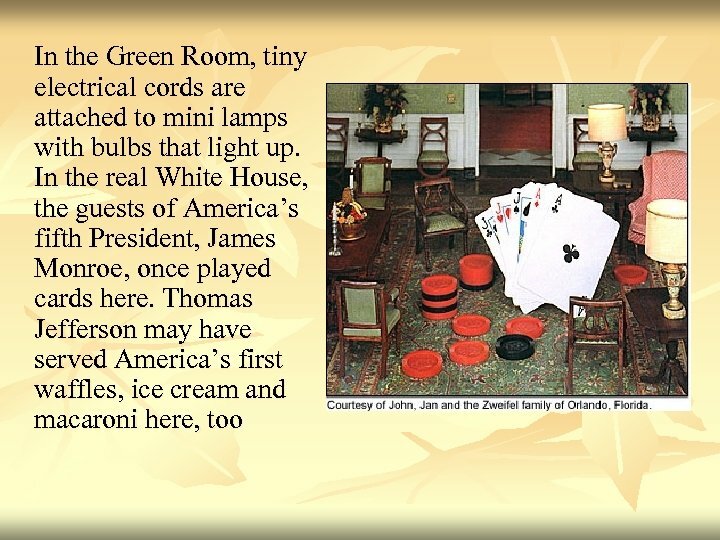 On November 1, 1800, President John Adams moved into the brand-new presidential home, the White House. America celebrated the great mansion's 200 th birthday in 2000. John Zweifel, 64, has spent 40 years making this 60 -foot by 20 -foot model. His version is almost exactly like the real thing. The phones ring, and the tiny toilets flush. 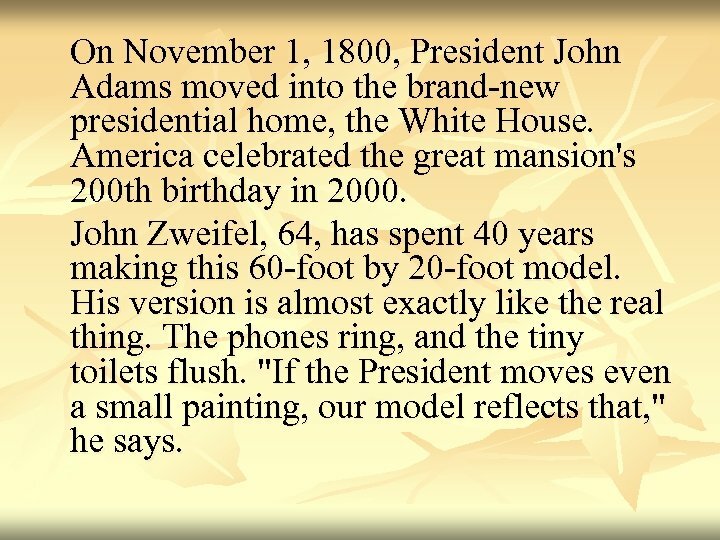 "If the President moves even a small painting, our model reflects that, " he says. 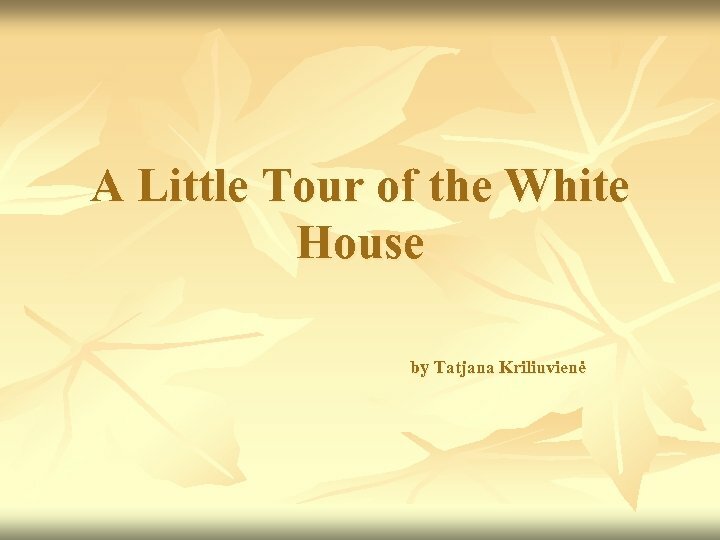 The mini model of the White House is a real mobile home. It has been seen in all fifty states as well as Europe and Japan. 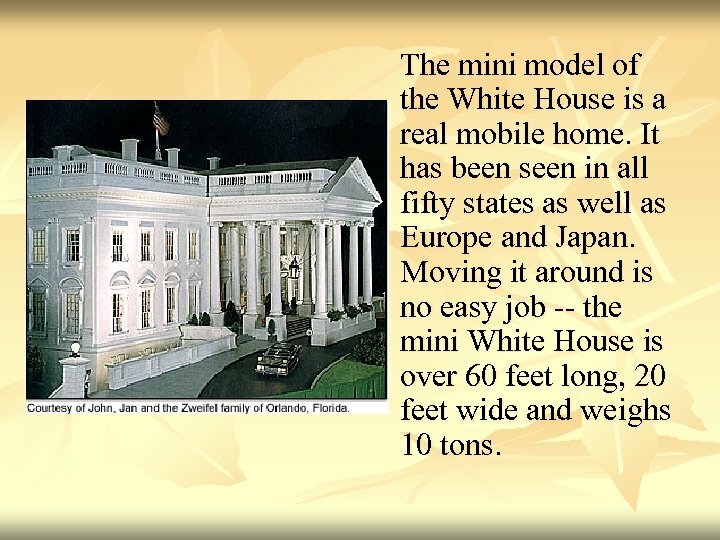 Moving it around is no easy job -- the mini White House is over 60 feet long, 20 feet wide and weighs 10 tons. Hello in there! 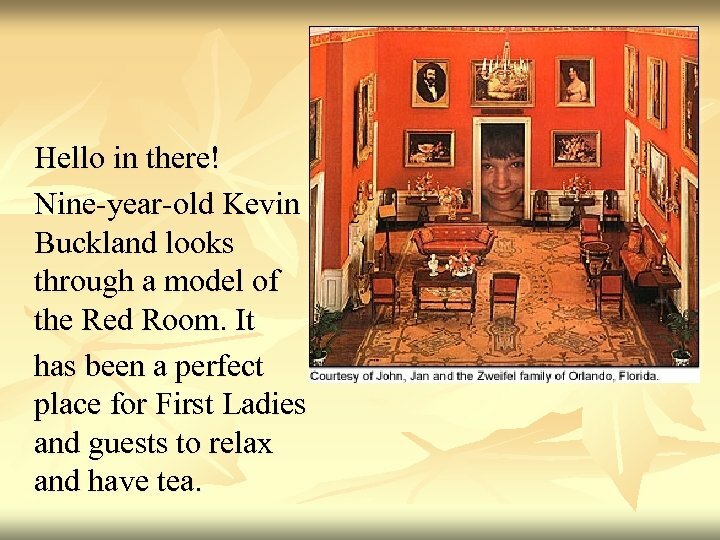 Nine-year-old Kevin Buckland looks through a model of the Red Room. It has been a perfect place for First Ladies and guests to relax and have tea. What would a mini library be without mini books? 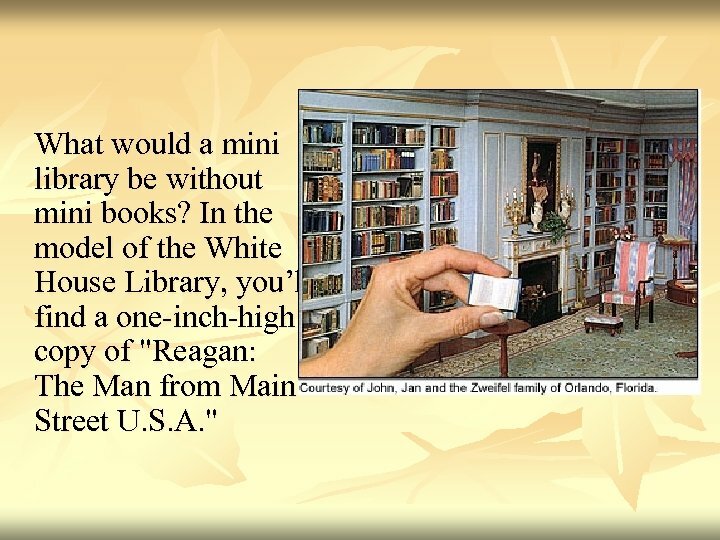 In the model of the White House Library, you’ll find a one-inch-high copy of "Reagan: The Man from Main Street U. S. A. " 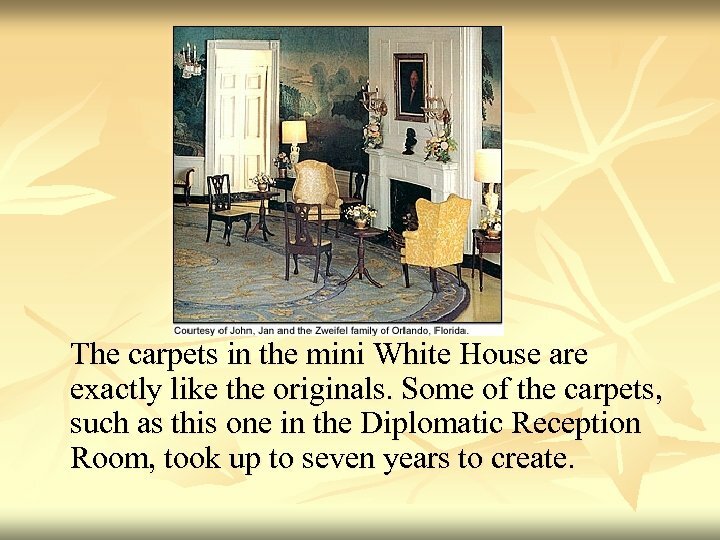 The carpets in the mini White House are exactly like the originals. Some of the carpets, such as this one in the Diplomatic Reception Room, took up to seven years to create. Every chandelier in the East Room is made up of 55 light bulbs, each the size of a grain of rice. Modelmaker John Zweifel once created tiny rollerskate marks on the floor, just like those left behind by President Jimmy Carter's daughter Amy in 1976. 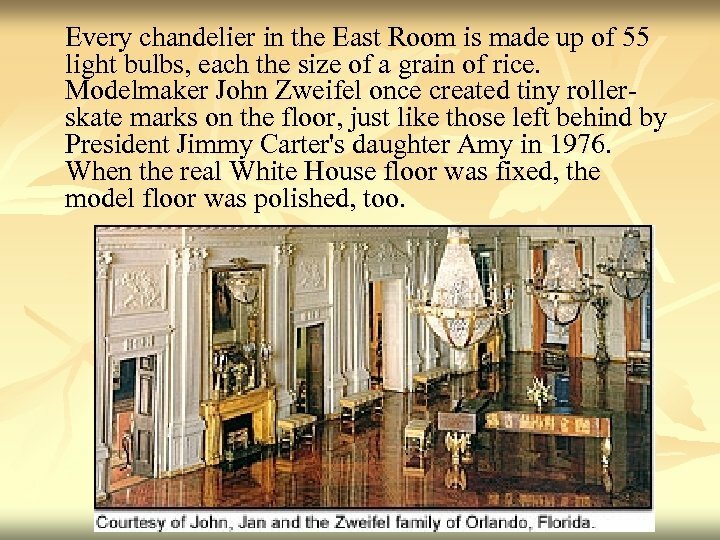 When the real White House floor was fixed, the model floor was polished, too. 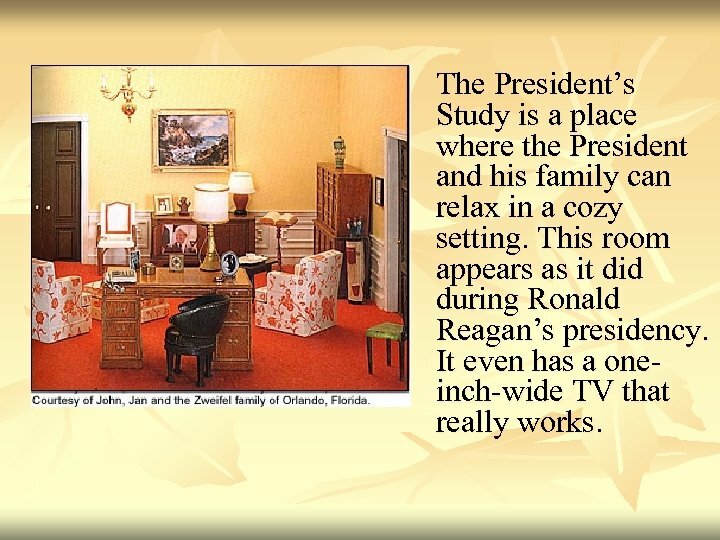 The President’s Study is a place where the President and his family can relax in a cozy setting. This room appears as it did during Ronald Reagan’s presidency. It even has a oneinch-wide TV that really works. This inkwell is only two inches high, yet it looks gigantic inside the Treaty Room. Artists hand-painted each of the tiny paintings in this space. 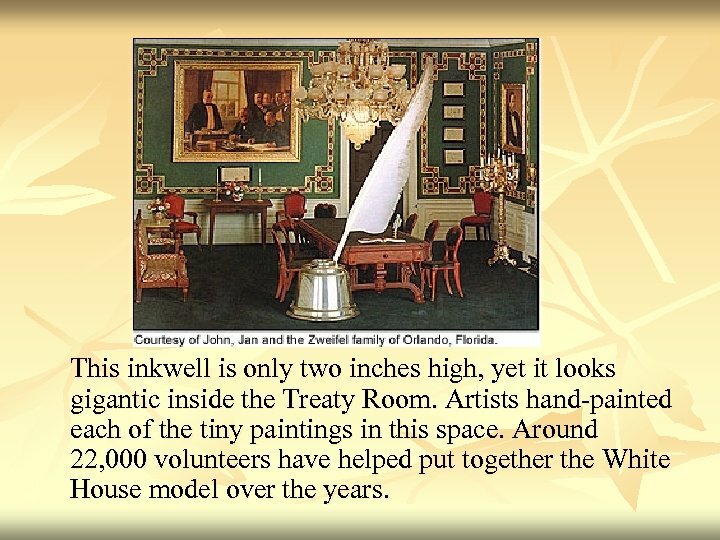 Around 22, 000 volunteers have helped put together the White House model over the years. This model of the Oval Office looks just the way it did when John F. Kennedy was President. To remind him of his early days in the U. S. Navy, most of the paintings show scenes from naval history. 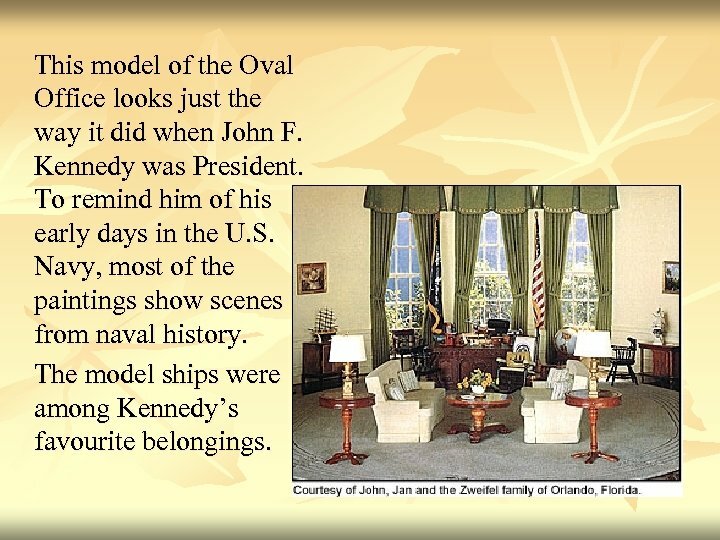 The model ships were among Kennedy’s favourite belongings. This is a model of the Oval Office during Richard Nixon’s presidency. 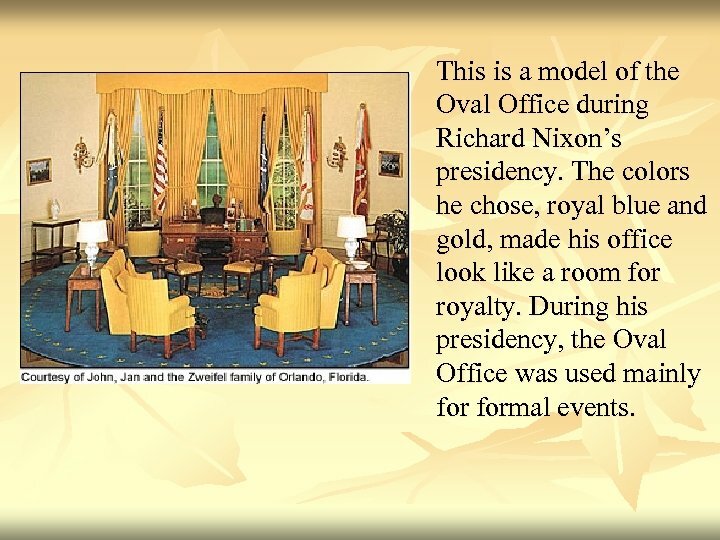 The colors he chose, royal blue and gold, made his office look like a room for royalty. During his presidency, the Oval Office was used mainly formal events.